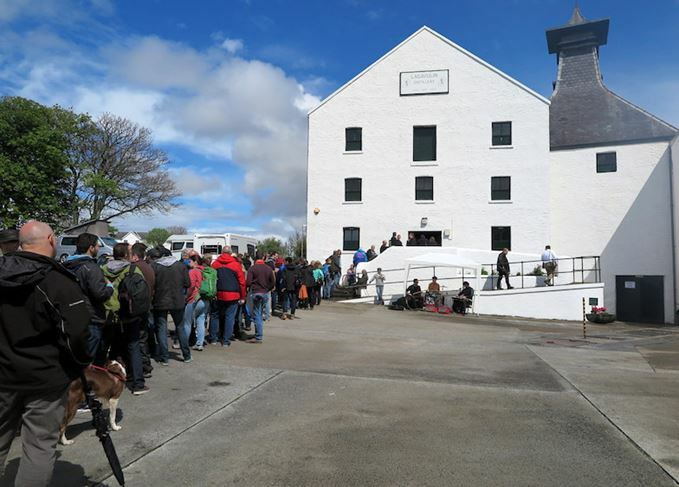 This year’s Islay Festival kicked off with some typical island weather and an undaunted, 3,000-strong crowd intent on celebrating one very special birthday. Martine Nouet joined them. It all started rather grimly. It had been pouring with rain all night and the road was flooded in many a place. But, half an hour before the doors opened at 10am, a crowd was already queuing, and some people had been in line since 7am. Judging by the number of tents pitched on the grass and the camping vans packed up on the parking by the distillery, there were some serious Lagavulin aficionados determined not to miss a minute of ‘their’ day. Once provided with their masterclass tickets and party accessories – a hat and a whistle – the party-goers could make their way to the courtyard where all the festivities were taking place. For this was a celebration, not so much of World Whisky Day (I don't have the same calendar, as the day for me is 27 March, in homage to the late whisky legend Michael Jackson), but of the 200th anniversary of the distillery. ‘A birthday party must include a gift,’ she told the crowd. ‘Have a look at the wooden box in front of you.’ In this intriguing box we found a ‘tasting companion’: five small bottles containing a different version of Lagavulin to be tasted, and the key ingredients and aromas of the single malt: malted barley, peat, Sherry-infused wood shavings, vanilla, dried figs, lapsang souchong tea and sea-salt. We were also given a more surprising present: a kaleidoscope. Were we going to play? No, it was just an implied reference to history. Like the distillery, the kaleidoscope appeared 200 years ago, in 1816. This was to be a sensory tasting. So music was on the menu with Fiona Middleton, a neighbour to Lagavulin who lives on the road to Kildalton and is well-known on Islay for her fiddle-playing to the seals. Fiona played her own tunes on a synthesizer and electric violin, and also sang. The idea was for everyone to add an extra sensory dimension to their tasting. The tastings, punctuated by Georgie’s anecdotes of her life as a distillery manager and a witty, self-written poem, started with the anniversary release, the 8-year-old. A dive into the elements – seawater and minerality (salted pebble) with the smooth caress of sweet malt. Then the 12-year-old to ‘taste the place’ and an invitation to pour a few drops into the succulent oyster placed on the side... To me the perfect ‘Lagavulin on the rocks’ to enjoy sitting on the shore and watching the waves crash. The 2015 Jazz Festival release followed. There are still some bottles at the shop but, according to Georgie, the stock melted last week as some visitors mistook it for the Fèis Ìle 2016 bottling. The influence of European oak brings in depth and notes of dried fruit and liquorice. The tasting ended with the Fèis Ìle 2016 bottling, an 18-year-old, a 49.5% vatting of American oak refill hogsheads and European oak refill Sherry butts (full tasting note to follow). Incidentally, why did people queue two hours to buy one when 6,000 have been released and will be available for at least the whole week? The two hours passed quickly, fuelled by the passion and dedication of a beaming Georgie. The distillery is very lucky to be managed by such a dynamic Ileach. Outside, some courageous (and hungry) visitors were queuing in the rain for a hamburger infused with Lagavulin, while others were lured by the lovely smell of pan-fried scallops coming from the Seafood Shack. Fortunately, the showers quickly made way for sunshine. This is what we call in French la douche Ecossaise (the Scottish shower). People immediately sat in the sun by the shore, a reminder of the first Fèis Ìle in 2001 when visitors were offered a large dram of Lagavulin 16-year-old to accompany pan-fried Lagavulin Bay scallops. I remember enjoying them with fellow writers, especially Michael Jackson who was mesmerised by the bagpiper playing a lament in front of Dunyvaig Castle. That day, the distillery had a record crowd of 350 people. Fifteen years on, Nick Morgan, head of whisky outreach at Diageo, reckons 3,000 people came to celebrate Lagavulin’s bicentenary. A birthday cake and a dram of the 8-year-old were offered to toast the distillery in the afternoon, between two showers. If the rain made some grumpy, the music played by Gulf Extreme, a very entertaining ceilidh band, would immediately bring a smile to the faces. Don’t forget that Fèis Ìle is a music and whisky festival. The two gang together. Meanwhile, Diageo ambassadors Colin Dunn and Erwin Wilson Trikowski entertained a somewhat younger and more feminine audience with interesting whisky cocktails: the first one, drawn from Dave Broom’s book Whisky: The Manual, included Lagavulin 8-year-old, soda water, Coke, green tea and ginger ale: a sort of Cuba libre revisited (shall I call it Islay Libre?). I preferred the Old-Fashioned (revisited also) with Lagavulin 16-year-old, Demerara sugar, Angostura Bitters and a concoction of seaweed freshly picked by the shore, then chopped and soaked in water. Dennis Mulder, Diageo ambassador in the Netherlands, was focusing on food in his four workshops. A kind of ‘choose the best’ pairing game (after a precise briefing). Four samples were to be tried with chocolate, cheese, a spicy brownie, dried apricot and ginger, fudge and savoury biscuits. It seems the cheese was often the winner. ‘The fat coats the palate,’ commented one participant. With 3,000 people in attendance, obviously not everyone could attend a class. But the distillery will be running events all week, including repeats of the masterclasses. Then again, if a day is not enough, will a week be sufficient? Marking the start of the annual whisky festival, and the transition of Lagavulin’s guardian. Music, malt and seafood rule as the festival spotlight turns on the secluded charms of Caol Ila. A decade after his untimely death, Dave Broom pays tribute to the legendary whisky and beer writer.